So I am late to the party. 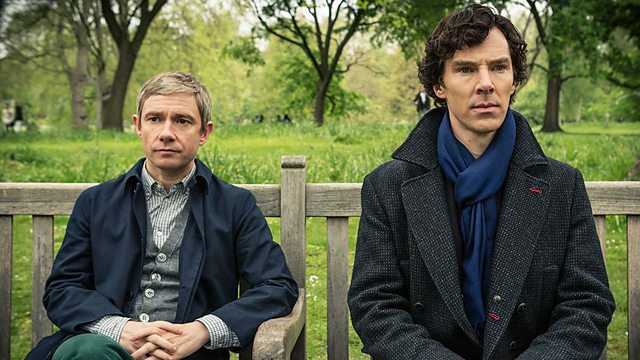 I have fallen in love with the BBC show "Sherlock"
I just revived my Netflix account since I have a tv I can stream to, and one of the first things I rented was the first season of Sherlock with Martin Freeman and Benedict Cumberbatch. Both are better known in the US from their performances in The Hobbit, where Freeman wears a weskit and has very large hairy feet, and Cumberbatch wears a dragon suit and chews scenery. Steve Moffitt took the original Conan Doyle series and simply updated it to the 21st century. This, of course, is not as difficult as it may sound, because Dr Watson served in the British Army which was engaged in the age-old business of thrashing Afghans and Pashtuns just as the British Army and NATO are today. In fact, the enemy in the 19th century was the Talib-ul-alm. Sounds like? You betcha-- the ancestors of the Taliban. Sherlock Holmes' character as Cumberbatch portrays it is very much the same as the Conan Doyle original. He is clearly seen in the light of modern psychiatric understanding, as a sociopath of the Asbergers persuasion. Cumberbatch does a fantastic job of being both amazing and insufferable. This is a terrific and very well-written show, and I don't think it could be written as well in the US. One of the best things about the first episode is how Moffitt cleverly confuses us into thinking that the skinny, slightly menacing individual is Moriarty when he is actually Mycroft, Sherlock's older brother. Nicely done. If by some stretch of the imagination you, too, are late to the Sherlock party, get with the program. You'll be amazed as I was. Great series. I really need to order the second season.